This week it was biscuit week and for a long time now I’ve wanted to make Bourbons, but I guess I just didn’t feel like it, so I handed the challenge over to the kids. Star went for the cream challenge and she made a softer cookie dough for her biscuits and piped them into rounds before I cooked them for her. Then she filled them with chocolate butter cream. I think they turned out pretty good, even though they were not all exactly the same. Boo just wanted to do her own thing so she made a biscuit dough she could roll and cut out shapes from. She wanted to do different sized hearts but I couldn’t find my pack of heart cutters, so she just chose shapes from the box. This is just a small selection of them after she’d piped icing on them. When I told the Little Man of the options he said he wanted to make a game. Mmmm a bit adventurous for a seven year old I think! Of course his favourite game at the moment is Mine Craft so he wanted to make Mine Craft biscuits. They had to be square to represent the blocks on Mine Craft. Then he decorated them himself, the middle biscuit is the player and the little ones around it are dirt blocks. I can’t really explain it any clearer. They had loads of fun with their baking and decorating, it was a great way to while away an afternoon. The biscuits all tasted pretty good too, especially as I just winged the recipe. Next week it’s bread week and I’ve been meaning to bake some bread for a while now so fingers crossed it will be me baking…although the kids will probably want to make some too! If you want to see what other bloggers have been baking this week then please check out the GBBO blogger linky over on Mummy Mishaps blog. I missed joining in with the Great British Bake Off last week, I just didn’t have the time. This week my kids were keen to have a go at the Jumbles so I’ve handed the baking over to them. First up though, my little run-down on this weeks program, Tudor Week. Seriously, Tudor Week! Well, it was the time of huge banquets and lots and lots of food, for rich people anyway. Something great from that time though was pies, now you can’t go wrong with a pie. We love our pies here, I love making pastry so that’s probably a big factor. Whether it’s a shortcrust apple pie or a water crust steak pie we can’t get enough. I really wish I’d taken a photo of the steak and ale pie I made last week, it was delicious and looked so lovely when I took it out of the oven. The contestants where told to make a signature dish of pies arranged in a Tudor style. It went ok, we had the usual eruptions, too thick pastry, not enough filling problems. The Technical was Jumble biscuits. Now this sounded easy until you saw how they had to design their biscuits. It looked fun, I think that’s why my kids wanted a go. The Showstopper was marzipan themed. I am somewhat addicted to marzipan and I only allow it in the house at Easter (Simnel Cake) and Christmas (Christmas Cake) because I tend to eat a lot of it. I’ll shut up now and get on with it..Ready, Steady, Bake! Paul Hollywood’s recipe asks for mace, aniseed and caraway seeds. I decided that if I put those things in our biscuits the kids wouldn’t eat them, we left them out, so we have a less spicy biscuit. wrap in cling film and chill for at least 1/2 hour. We split the dough into four pieces and each child and myself made a selection of shapes for the biscuits. I didn’t count how many we had but there was at least 20. The kids had so much fun with their shapes. I did have a go at the Tudor shape but it was too fiddly. The Great British Bake Off Week Two – It takes the biscuit and dunks it! So here we are in week two which is biscuit week. The signature bake was for 24 uniform biscuits, the technical bake was Viennese Whirls and for the showstopper, what else but Ginger Bread models. This week we saw biscuits on the floor, the collapse of the gingerbread, Candice change her lipstick for something much pinker (she’s promised red for bread week) and Salasi not lose his cool but maybe lose his magic touch a little. The first round went quite well for most, but for Val who didn’t manage to finish her biscuits, and Louise making her bara brith lamb scones rather than biscuits. I think this round is really easy, just pick a nice crunchy biscuit that snaps when you break it and decorate them all the same very neatly. The technical challenge is where the contestants are given the bare minimum of instructions to make the recipe. Most of the them did really well, but it was those that chilled their whirls before baking that had the most success. The moral is, if it has a fancy design and it’s a very soft biscuit dough, it needs chilling before baking. 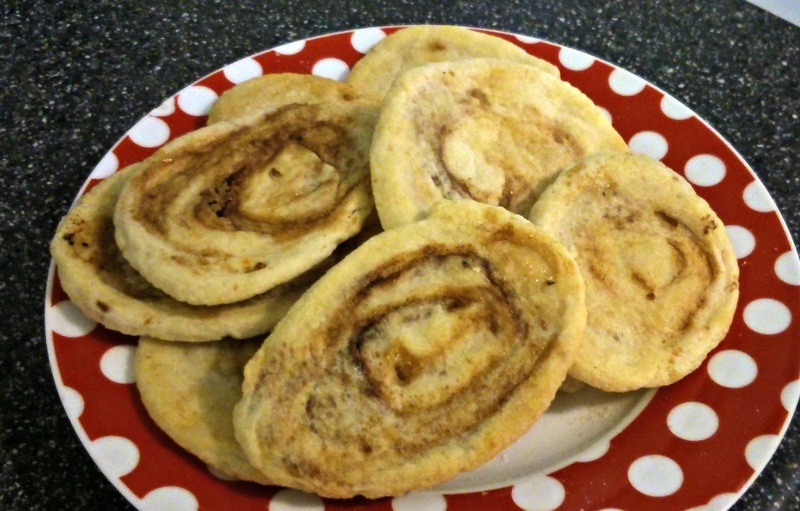 The whirls didn’t melt during cooking and you could still see the pattern. Having most success with her whirls was Candice, it must be her lucky lipstick this week. Finally we have the technical challenge where the bakers had to recreate a scene that had meaning for them with gingerbread. Val’s collapsed and was unfinished. Louise tried really hard to keep her church and marriage intact without success. Mike presented a wonderful scene of Oxford student days and Tom was stuck up a mountain with his friend Pod. Selasi managed to keep his church standing but the flavour was lacking. Jane’s Brownie presentation looked fantastic but also lacked flavour. It was Candice that stood out from the crowd though with her pub, complete with a ginger cake pub carpet, a pool table with a jelly top and her mum and dad behind the bar. It was really clever and according to Mary and Paul, it had the taste too. No surprise then when Star Baker with the bright pink lipstick was Candice, and she deserved it. The person going home was Louise, who had a pretty disastrous week all round. I was hoping to have a go at baking along this week but I’ve not had the chance so I’ll share some I made earlier. 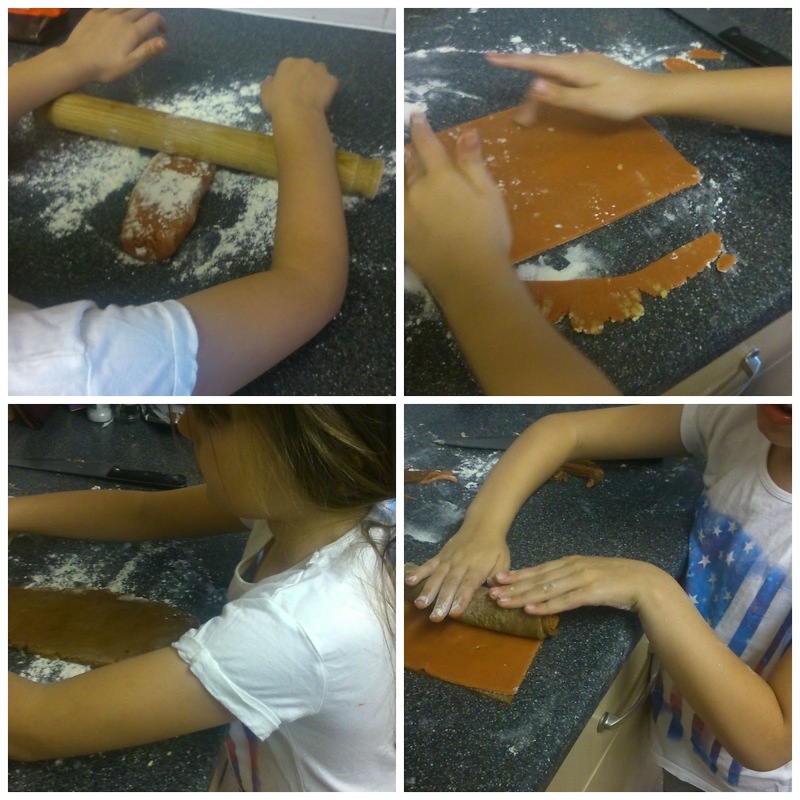 Here are the Kids in the Kitchen’s take on Mary Berry’s Chocolate and Vanilla Pinwheel Biscuits. After a trip to London to meet Bee Berrie, here are some lovely Sprinkle Cookies that Boo made. Finally here is our Gingerbread House Showstopper. I hope you are enjoying The Great British Bake Off as much as me, I’d love to know what you think of it and whether it’s inspired you to do some great bakes. This week on the Great British Bake Off was biscuit week and we had lots of snaps and crunches and a few little mishaps of course. The signature bake was 24 biscotti which were all to be uniformly formed and baked to perfection, in fact baked twice to perfection. I’ve never had a go at making biscotti but I know they go well with any overpriced cup of coffee from a coffee shop. So Mary and Paul both agree that cranberry, chocolate and hazelnut is the best combination for biscotti. So, do any of the contestants comply? Don’t be silly, we get everything from goji berries (I love goji berries) to physalis and even rosemary. Mr Hollywood seemed a little worried about the rosemary but in the end Ian’s Orange, Cranberry and Rosemary Biscotti got a thumbs up. The Technical Bake was Paul’s recipe for Arlettes. No, I’ve not heard of them before either…but I have now, I’ve even baked some! Basically, they are biscuits made from puff pastry with a lamination of a butter, sugar and cinnamon layer and rolled out really thin. Then baked quickly on each side to produce a thin crispy biscuit. They really are delicious too! Little Dorret came in first on this round, closely followed by food blogger Flora, the youngest contestant at only 19. Marie had trouble with her oven setting and only managed half a batch. She didn’t do too well in the first round either with her biscotti being a bit too tough. Is there really a curse of the star baker? Final Show Stopper round and the bakers are asked to make a box out of biscuit to hold biscuits. It’s a biscuit lovers dream come true. Most of them made this 3D stuff look pretty easy, I can tell you from experience of my Christmas Gingerbread houses, it does take some practice to get your biscuits standing erect! I got all excited seeing Little Dorret using my favourite Matcha powder for her little green frogs. Paul and Mary were not impressed though, either with her biscuit cutter frogs or the matcha taste…pah, how would they get on in Japan if they fancied a cuppa! I was very intrigued by the Earl Grey tea bag biscuits made by both Mat and Flora. I will have to try them sometime. I felt very sorry for poor Nadiya who ruined her first biscuit box lid herself and then had her second attempt destroyed by presenter Sue. She was so close to tears, I wanted her to cry, it was tear worthy, I’d have cried. 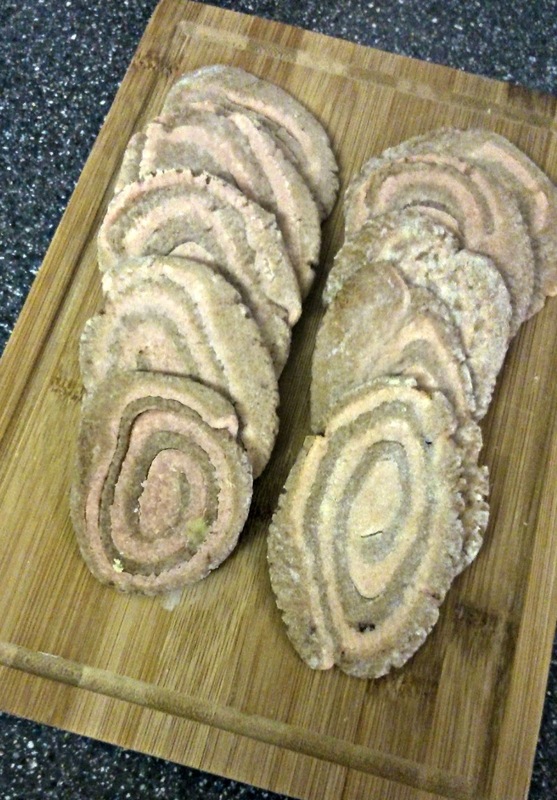 So after much deliberation I decided to bake for my bake off challenge with Silver Mushroom is some pinwheel biscuits. Strawberry and Chocolate Pinwheel biscuits. Add the egg and knead together to make your biscuit dough. Add strawberry flavouring and food colouring into second half. Roll into two sausages, cover in cling film and chill in the fridge for at least 30 minutes. Roll the dough into two rectangles and then put one on top of the other. Roll them up into a sausage shape. You can leave them like this to cook, but I was looking for something more crispy so I rolled my slices again to make them thinner. Cook for 8-15 minutes depending on thickness. Of course I had my little helper in the kitchen with me, thank you Boo. Thanks for stopping by my blog, let’s stay in touch, you can also find me on Twitter, Facebook and Instagram and I love following back. Welcome to this weeks Kids in the Kitchen. This week we have spent a lot of time in the kitchen together especially as it’s been half term. Boo helped me make our Christmas Cake, I’ll tell you about that another time but it’s nicely stored away now ready to be ‘fed’ with brandy every week until Christmas. Boo said she doesn’t mind if she doesn’t have any so long as I make another Christmas Cake, preferable chocolate…I think maybe a Chocolate Log will be in order. On Halloween we had some friends over and we made some plain fridge biscuits and the children had to decorate them as scarily as they could. They had lots of fun. Our recipe this week is Pumpkin and Orange Cake. I did make pumpkin pie but it didn’t go down very well. I thought it was lovely but no-one else liked it. As always I like to start with saying thanks to those that joined in last week. This time thanks goes to T from Autism Mumma who made a delicious looking Rustic Apple Crumble. Thank you for joining us. If you would like to join in please use the linky at the end of this post. I’d love to see and share what you’ve been cooking with your kids. 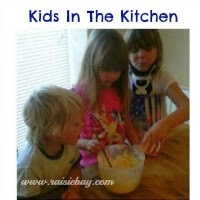 If you need some inspiration check out our Kids in the Kitchen Pinterest board. beat the eggs into the melted butter. While still warm in the tin, pour over the rest of the orange juice. mix together the butter, icing sugar and then add the orange juice. Boo had lots of fun mixing the ingredients. She was happy to keep my secret and we didn’t tell the rest of the family that their was pumpkin in the cake. Everyone had insisted that they didn’t like pumpkin, so I wanted them to try the cake before knowing the ingredients. We all decided it tasted like carrot cake only sweeter and with more of an orange flavour. Mixing in the secret ingredient…shhhh!